Our outdoor home improvement project for the year has been completed. 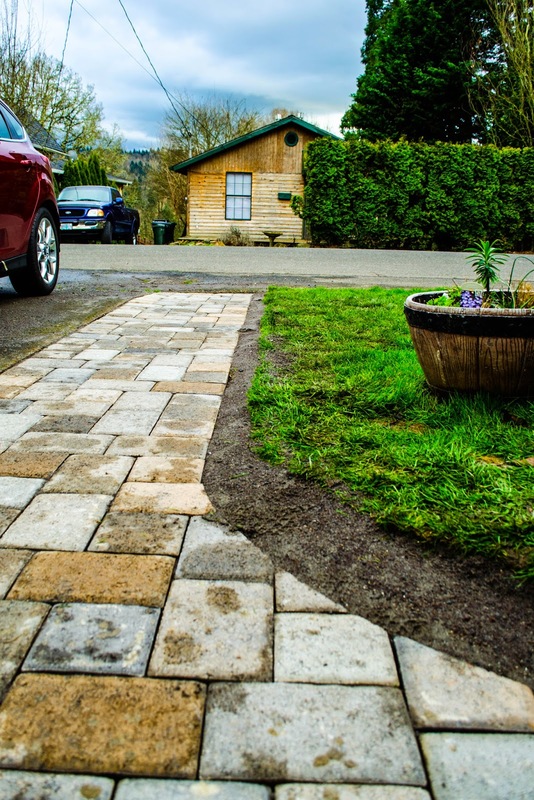 We had a grassy patch of ground between the driveway and the house that has been turned into a nice, paver stone patio. 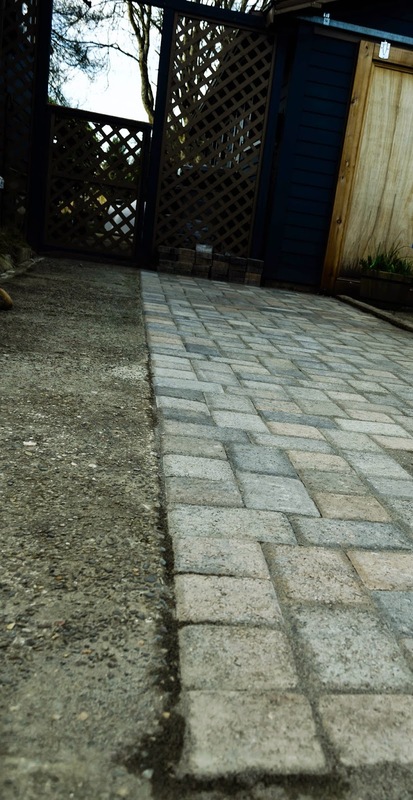 At the same time we took out grass along the drive way and created paver stone walkway. No more tromping in the mud to get to the house. Here's a look back at the journey. My friend Katie from Katie's Gardening came with a crew and dug out the grass, filled it with gravel, compressed it, then added sand, compressed again and laid the stones with some minor cutting. It's wonderful to step out onto a clean walk way when I get in or out of the car. We have now added some dirt back to the edges and have reseeded. 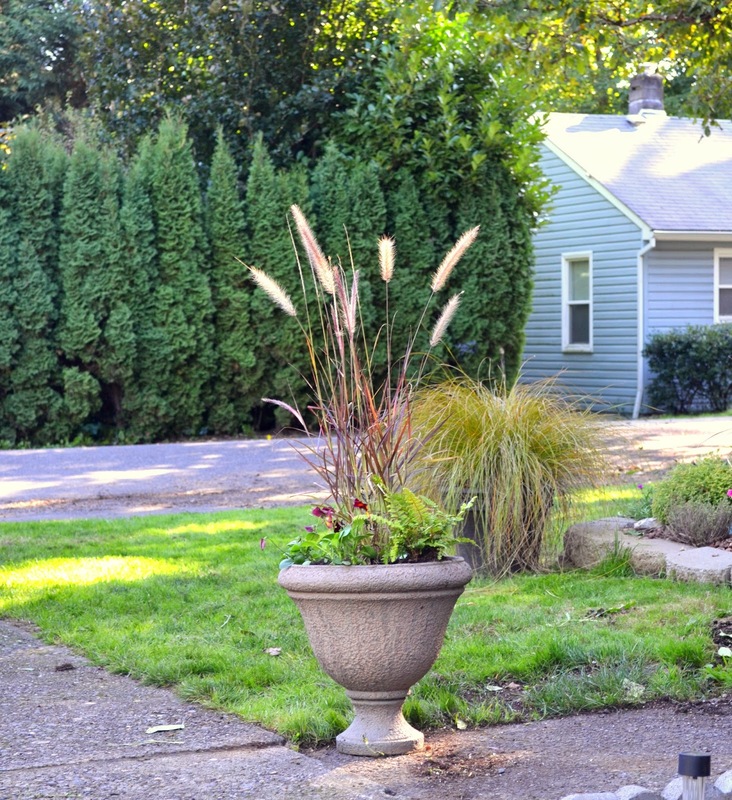 In all, we likely removed a 3' x 20' section of lawn by creating the paver walkway and removed a 5' x 20'ish section grass section in the grassy patch. Today, I got my Mother's day present early as I requested new pots to transplant my clematis into and pot up my baby Japanese maple trees. Hubby complied and even helped fill the pots with soil. I feel that my new front 'hot' patio is close to completion. All that is left to complete this project is to acquire five or so more pots to put my new agave's in. I've been calling this space my new 'hot' patio as it will get toasty warm on summer days. I think the agave's will love it. 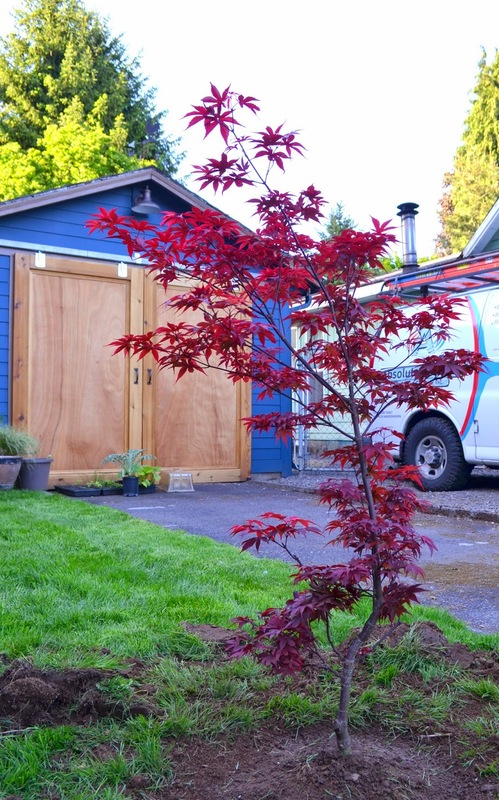 Thanks to Katie's Gardening for a great installation! I'm thrilled with this new space. It's tidy and there is far less grass to mow in the front. I love it! My dogs constantly track mud into my house. It's such a pain. 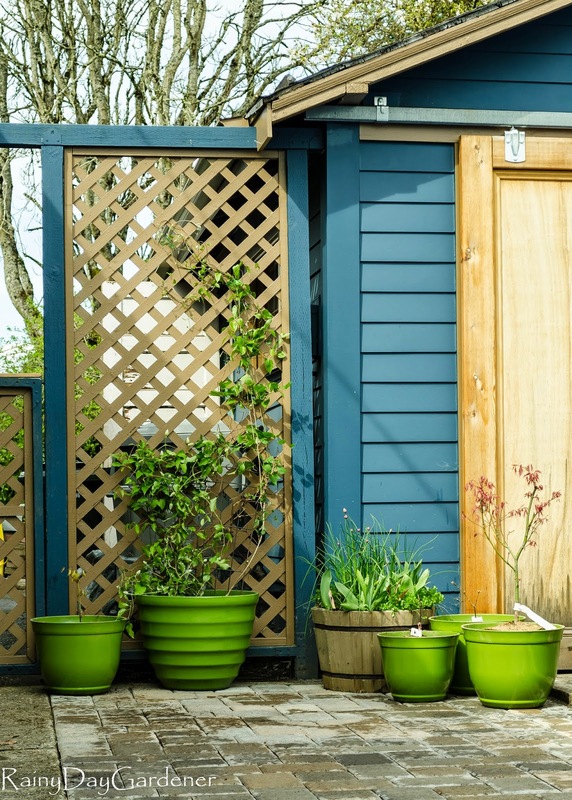 I love the green pots against the blue garage. :o) Mondo excellente! Thank you! Now, it's back to saving $$ so I can do the back yard! What a difference it makes. I love it. Now you've got all that space for plants and other goodies. Exciting! I love the green pots. It really ties it all together and contrasts beautifully with your house color. Nice that you got it done so early. You've got the whole growing season to enjoy it. I got some pretty heirloom nasturtium seeds to put in some of the pots for summer color. I'm really happy with how it all turned out. The new patio is fabulous! Katie did a great job. 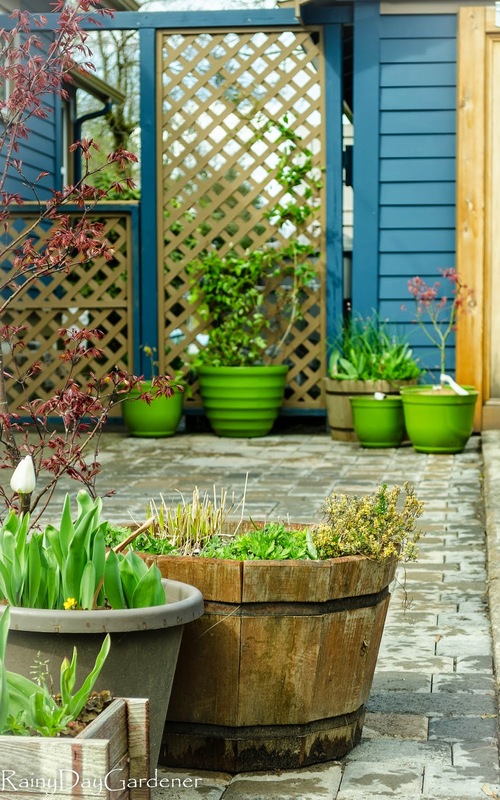 Love the bright green pots against the blue garage. Yay for the hot patio! Great color choice for the pots, such a cheery bright color. What are you looking for as far as the agave containers? I thoroughly approve. I still remember with pleasure the day I finally got rid of the lawn-mower! Your green pots would suit one of my daughters - she absolutely loves that colour. She has green clothes, green kitchen equipment, green garden tools... everything green! We keep trying to come up with a system for avoiding tracking mud into the house. Your solution to the problem is both handsome and efficient. My hubby and I are working on some landscaping projects ourselves.. it is VERY slow going! haha! But your project looks great, it must feel so good to be finished!! What a difference! It all looks great and I know you're going to enjoy this a lot. Love your green pots.